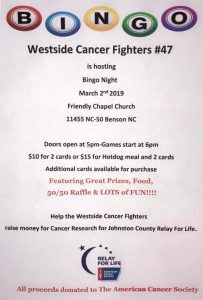 The Westside Cancer Fighters are a team with for Johnston County Relay For Life and we are hosting a BINGO fundraiser to raise money to do our part in the fight against cancer. Doors open at 5pm games start at 6pm. $10 for 2 cards or $15 for hotdog meal and 2 cards. Additional cards and food available for purchase. Featuring Great Prizes, Food, 50/50 raffle and LOTS of fun while helping to raise money for such at great cause.